Disclosure: I was provided with this paint and stencil from PLAID free of charge in exchange for my fair and honest review. Please see my disclosure policy. This post also contains affiliate links, which means that at no extra cost to you I can make a tiny bit of money to help support this blog. Thank you! 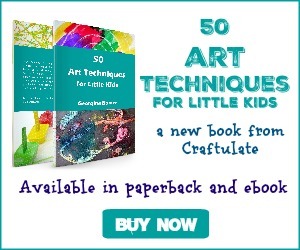 Since I became an ambassador for Plaid Crafts, my eyes have been opened to the world of stencils! 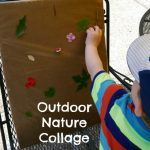 I’ve used them for my own projects like this woodland scene canvas, but also for crafts with my son, like these easy stencil cards, decorated frame, homemade tic tac toe set – and more! 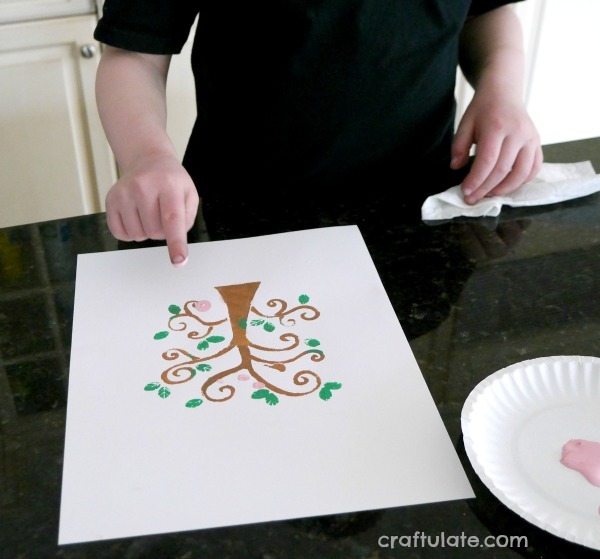 So when I received this cute “curly tree” stencil, I wanted to make some springtime art with it, but involve my son. 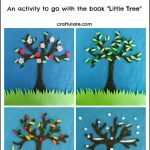 There’s blossom everywhere at the moment – so that’s what inspired this fingerprint tree art! I used stencil tape to adhere the tree stencil to a piece of white card. I poured some Apple Barrel Toffee paint onto a paper plate and used a spouncer to dab the paint onto the stencil to cover the trunk and branch areas. (I’ll be honest, I was hoping that my son might help me with this part, but he just wasn’t in the mood!) Then I used Apple Barrel Green Clover to complete the leaves. After it had dried, F was happy to help me with the fingerprints! 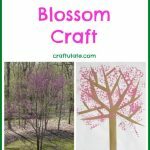 He dipped a finger into some Apple Barrel Light Pink paint, then made prints all over the tree to resemble blossom. 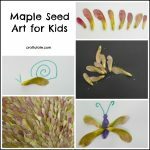 The paint came off his finger easily with a baby wipe – Apple Barrel paints are great for kids as they are water-based and non-toxic. The final artwork was so pretty!